Living in a small apartment doesn’t mean that you can’t bring the beauty of nature into your small home. There are design opportunities for even the tiniest of dwellings. Indoor gardens are gaining more popularity as people look for ways to improve their homes with live plants, whether they are edible or for decoration. By making a design plan for your space, you can grow a luxurious garden that will make you happy to come home. Before you begin, it’s important to decide what type of garden you will grow. Will it be an organic, herb or vegetable garden or an ornamental garden? Once you’ve decided, then it’s time to look at the studio’s natural light sources. Assess the space around your apartment’s windows; they will be your central location for your garden, especially if you plan to grow vegetables. You may need to rearrange furniture so that you can clear the window area for your new indoor garden. For instance, if you have bookshelves corresponding to window space you may want to move the books to another location in the studio. Your indoor garden will need the prime real estate that the windows have to offer so that they can grow and thrive. There are so many appealing ways to display your indoor garden. Wall shelves are always an option of course, but by thinking outside the box you can use unusual items to show off your plants. You can even repurpose furniture that you currently own to create an interesting garden centerpiece for your space. Look for old ladders, stainless steel tubs, dressers and wooden crates that can be used as a base for your plants. A wonderful and space-saving growing arrangement can be created by hanging pots from the ceiling – just be sure that the pots will get enough sunlight and that they won’t create a safety hazard. Vertical planting is also a great option in a small studio and does double duty as a beautiful interior design. Terrariums make a perfect place to grow herbs in a sunny spot too. If you don’t have a convenient place in your apartment you can think about a grow tent. There are many edible plants that are surprisingly easy to grow in small containers, even indoors. Grow a variety of salad greens, a fragrant herb garden and a surprising array of culinary peppers indoors to spice up your meals. If you have plenty of light, try growing tomatoes or strawberries for a fresh treat. Potatoes, carrots, and radishes can all be grown in deep containers in your indoor garden space. If you have your mind set on creating an ornamental garden of Eden, there are many indoor plant options for you. The easiest houseplants to grow indoors are jade plants, spider plants, ivy, cactus, and philodendron. You can even grow small trees and shrubs indoors to create a dramatic look to your studio. Indoor gardens have been proven to elevate your mood. They also help to clear the air of dust and other pollutants. Growing edible plants can have a tremendous effect on your health, help save money, and they taste great too! 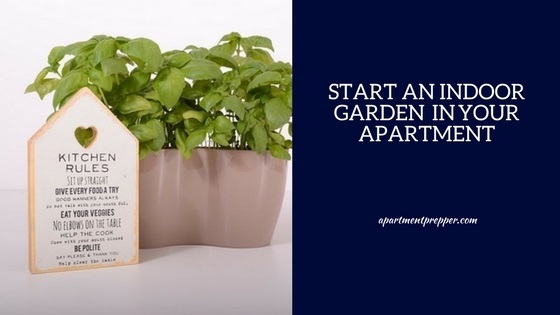 With a little planning, you can easily transform your studio apartment into a lush indoor garden. By Craig: “I love to spend all the time I can outdoors and find every excuse to leave my house. I write about everything from backyard DIY projects to gardening. If you can’t get a hold of me I am probably on a trail or a boat. I like the idea for growing some fragrant herbs. I am going to give this a try. Hi Ben, Great! Glad to hear you will give this a try. Let us know how the herb garden turns out. Thanks for the comment!